I believe that Homeland Insecurity is one of the most annoying quests of Soloman's Island. For this mission you will be required to visit multiple fire teams and do things for them. The quest isn't so bad with a walkthrough, which luckily is exactly what you have me for! The first tier is cake so let's skip right on over to Tier 2 where it tells you to "Move forward and kill the Dreyrugr Lord". This guy spawns right where the quest circle is and has a really long respawn timer. I think his spawn timer was patched though because after I took him out he spawned within a minute. Either way, if he isn't spawned and you see someone else in the area invite them to join your group. There is no point fighting over the same mob that you need. Also help will be really useful for the next tier. 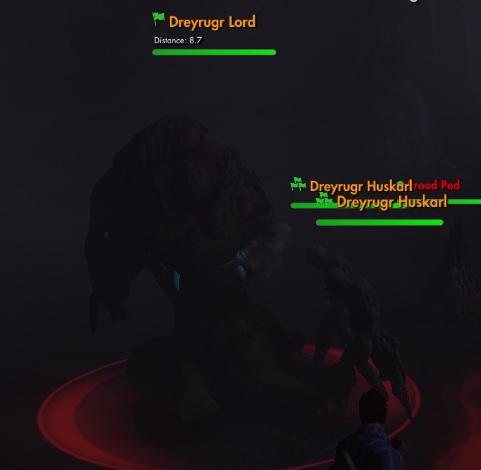 The Dreyrugr Lord that you need to kill looks like a giant brain. A picture of him is below but it was dark out at the time in game so it might be semi difficult to see him depending on your screen's brightness. After you kill him you will move onto Tier 3 which has you find Fireteam Charlie, easy, and then find their supplies. The Medical Crates are easy as pie to find since there are so many of them but the Sentry Gun parts aren't so easy to find. Mainly because the forest is... dark and when it is dark out in game the forest is... even more dark. So needless to say sometimes it's really difficult to see where you're going. It also doesn't help that the mobs here are extremely annoying ones. Here is a video to help you find the Sentry Gun Parts. If that still doesn't help you that much here are a few pictures showing you where the Sentry Gun Parts are. Let's start off with where they are located inside the circle on your minimap. The cottage is the solid object right in front of me and to the left. Now that you know where you'll be going on the minimap let's take a look at where the Sentry Gun Parts are in relation to the cottage. It's a bit dark out in the picture, like I said this forest gets really dark and so does the game! If you're having trouble seeing anything in the picture click to enlarge it. After you complete this whole tier you will move onto the final one. Run over to the location you're pointed to on your map to find a load of dead bodies. Poor fire team. The very next part of this quest has you use the nearby Binoculars and look at who could have caused this massacre. If you don't know where to look this part is somewhat hard but luckily you have me! What you want to zoom in on is the mob to the right of the bodies, you can kind of see it under the light if it's dark out. Here is a picture of this monster! Click on the picture to enlarge it. Since it is so hard to see the monster is circled in blue.